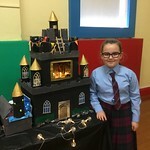 Ms.O'Donovan's 5th class showcased their Hogwarts castles in a fabulous exhibition in our school hall on Wed 24th October. The girls worked on this project in the weeks leading up to Halloween, constructing the castles from recyclable materials , decorating the interiors and even adding lights and magic spells! The hall was in darkness while the theme tune from Harry Potter played in the background as classes got the opportunity to see the creations and ask lots of questions about the castles. Well done to the girls for their creativity and skill in creating their masterpieces!